Boxwood is a shrub or small tree that usually grows well up to hardiness zone 5. They are marginally hardy in Minnesota (hardiness zones 4 and 3). Despite that, boxwood can be found occasionally here in the landscape. Where boxwood is commonly grown in landscapes in states further south, the most serious insect pest is boxwood leafminer. In the upper Midwest this insect is rare. A resident in a Minneapolis suburb recently reported the presence of this insect in her boxwood. in the bottom leaves. Photo: John A. Weidhass. midge family (Cecidomyiidae). This insect spends the winter as a larva inside boxwood leaves. It becomes active when the weather warms in the spring and eventually pupates and emerges as an adult. Adults lay eggs inside the boxwood leaves which hatch later in the summer where they remain through the winter. There is just one generation a year. 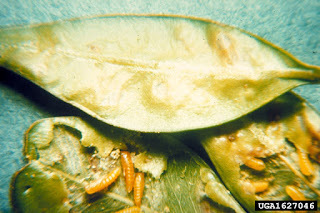 The feeding of the larvae causes irregularly shaped swellings in the leaves. These damaged areas yellow at first and eventually turn brown. Despite this appearance, this feeding is generally just cosmetic, just affecting the plant’s appearance. In most cases, it is best to tolerate boxwood leafminer feeding as it is likely causing no lasting injury to plant health. Keep in mind that this is a rare insect in Minnesota and not widespread. It is not clear where this insect occurs in Minnesota. If you live in Minnesota and have a boxwood, I would be interested to hear whether you have encountered this insect or not. Contact me at hahnx02@umn.edu.